I am sure many of you have seen this done or are watching it being done on other blogs, etc, and now it is my turn to hop aboard the bandwagon and also partake in the challenge. Of course I am picking a month which will be extremely busy, but ohhh well, if not now, then never - or something along those lines. 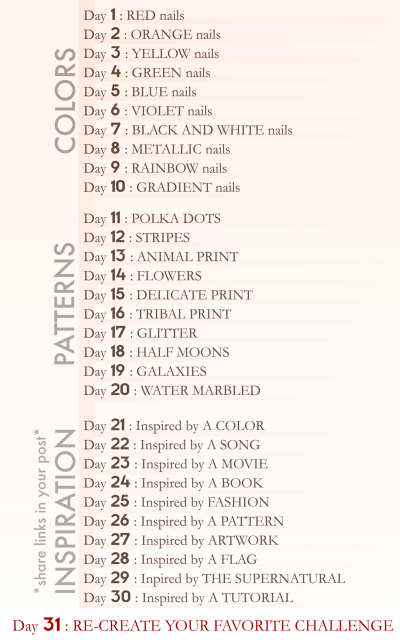 I am going to try to get a bit ahead of the game and do a bunch of nail painting tonight so I can start posting them on a set schedule everyday.. Especially since I am gone for a few days next week.. That isn't cheating.. right?! So, day one.. Red.. Done! 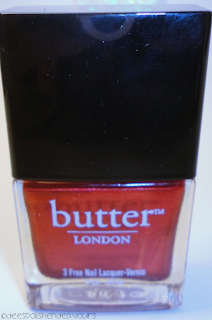 I snagged a red from my untried drawer.. 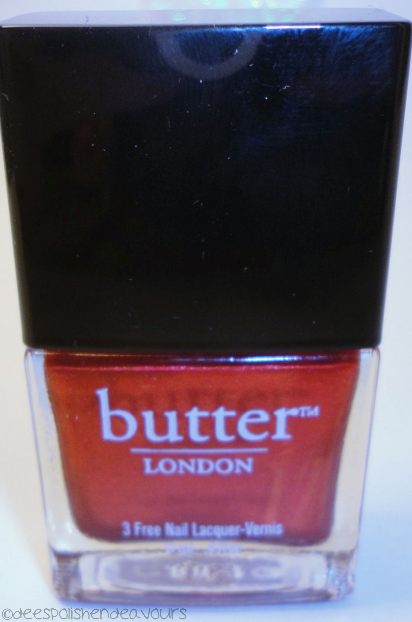 It happens to be Butter London Knees Up... annnnnd.. I kind of.. uhhh.. don't like it? It has a metallic-y type of finish.. And I am just not the biggest of fans. BUT, I also didn't DO anything with it.. So maybe if I were to nail art it up I would like it a lot better? Who knows! I will find out sometime though. The following blogs are also doing the 31 day challenge right meow - you should check them out!! 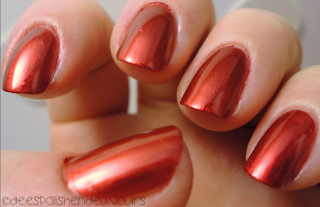 Zara, Life and Polish, Manicure Addict, Polish Pauper, Bright Lights, Big Color & ManiCured!